When you start the game, you are in Body form, your normal living self, but when you die your soul is bound to the Nexus. At this point, you will re-awaken there in Soul Form; the downside of this is that you will have your maximum HP halved in that state. You will do more damage while in Soul Form compared to Body Form if you have White Character Tendency. Each time you defeat a world boss, you will automatically be revived if you are in Soul Form, which means you are transformed back to Body form. There are items called Stone of Ephemeral Eyes which will also revive you to Body form and full health at any time. In Soul Form, if you are online, you can lay down a Blue Eye Stone to be summoned into another player's world to help him/her defeat a Demon. Doing so will restore your soul to your body. Alternatively you can invade another player's game as a Black Phantom with the aim of killing the host. If you are victorious you will regain your body. Regaining your body in another player's world will revive you at the start of the world you last died, in your own world. See the Online page for more details. The Nexus is the town hub, so to speak, in this game. It is where you can use the archstones to access any of the five worlds (multiple access points in each, providing you have been to them at least once). You can also buy equipment, repair/upgrade items, learn magic and miracles, and store items and equipment for later use. At the very top floor you can find the "Pantheon" / hall of fame, where the online portion of the game tracks world stats. See the The Nexus page for more details. Souls are the catch-all in the game, they are both Currency and Experience. You will use these at shops to purchase and repair and upgrade equipment (also need an item to do upgrades — more later on that), and you need them to buy increases to your stats, which is how you level up. When you die all of the souls you have are dropped in a Bloodstain, if you make it back to your Bloodstain you can get all of your souls back. If you die again before you recover a Bloodstain all souls in that stain are lost. Note that items/weapons/equipment/etc. are not lost when you die. Don't look for your bloodstain at the exact point where you died, though. It will be left at the place you were about 10 seconds before the instant you died, so if you were running and fell off a cliff to your death, your bloodstain won't be at the bottom, or even just where you fell off, but back in the direction you were running from some seconds before. For example, people who suicide in the Nexus by sprinting up the stairs and jumping off the upper ledge will find their bloodstain almost at the bottom of the stairs near the blacksmith. Your blood stain is easy to distinguish from those of others, since it is larger and more visible, and it has blue wisps of soul mist swirling above it. Touching your bloodstain does not take any time, like picking up an item does, so you can even do it during a heated combat if it is in the middle of enemies. 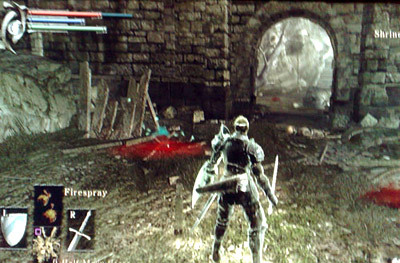 You do need to drop your shield for just a moment, click your bloodstain, and survive the annoying "You Regained Lost Soul" notice obscuring the screen. World Tendency is a way the game adjusts the individual difficulty levels of each world. Worlds with whiter Tendency will have enemies with less HP, and doing less damage, but also the experience and drops from enemies are less. Darker tendency worlds will be the opposite. Harder enemies and better loot and more souls available. You can get an idea of the light/dark state of each world by the shade of color of the archstone in the status menu screen. See the World Tendency page for more details. In addition to the alignment of each world, your character has their own personal tendency. See the Character Tendency page for more details. This is done at the blacksmith. Weapons are usually not very expensive to repair and will last a long time, whereas armor is very expensive and needs repairing often. When an item's durability degrades close to zero it may break at any time, at which point it loses most of its effectiveness. Make sure to keep your equipment in good condition. The blacksmiths can also upgrade weapons with various upgrade stones and souls. Only weapons and shields can be upgraded. The game autosaves regularly and on most events, such as picking up an item, loading a new area, and dying. You can tell by the small blinking white dot at the top right corner of your screen. You can manually save your game simply by entering the Equipment menu. However, saving the game will not respawn you to a particular location if you die. Instead, your Soul Form will respawn at the Archstone associated with the area your last save was, and subsequently where your Bloodstain will be. Crystal Lizards that have disappeared (not dead or had run off a cliff) will be replaced at their regular spawn location. Trap triggers (e.g. pressure plates in 4-1) will be reset. Stepping on them again will trigger them again. Items dropped on the ground, by the player or by killed enemies, will disappear (apart from a few special drops). If you left an item near Sparkly the Crow's tree, the item will disappear and be replaced with your reward next to the tree. Wounded enemies will return to their original spawn location, with full health. If this is your first playthrough, there are a number of issues that you would be wise to consider before killing your last Archdemon. More information here.